In his 2010 space policy speech, President Barack Obama canceled the Constellation Program and touted the rise of private companies to sell their transportation services to space. He also put the kibosh on the Bush Administration’s plan to send astronauts back to the moon: “But I just have to say pretty bluntly here: We’ve been there before.” That’s true, of course, and some say that there’s no real reason to go back to the moon. But others say that we haven’t explored the moon to any real extent at all, and in addition to preparing for longer-term space missions, we just might find something interesting on our favorite hunk of space rock — something such as evidence of volcanic activity. Thanks to samples retrieved during the Apollo missions, we know that there was volcanic activity on the moon some 3.1-3.9 billion years ago. Scientists generally believed that, in the past billion or so years, there hasn’t been any lunar volcanic activity. But according to a paper published in Nature Geoscience, scientists are wrong about that timeline. Newly identified rock deposits instead indicate that the moon was rife with volcanic activity within the past 100 million years, corresponding to the time when dinosaurs were hanging out on Earth. Due to all that activity, the moon would have been a lot warmer than previously thought during that time. The rock deposits that lead to this discovery are called IMPs, or irregular mare patches. They have a variety of different textures — smooth and rough, round and block shaped, etc. — and are evidence of basaltic volcanic eruptions. Until recently, Apollo 15 was the only craft to actually find and identify one of these deposits, which led scientists to conclude that the single instance was a rarity. 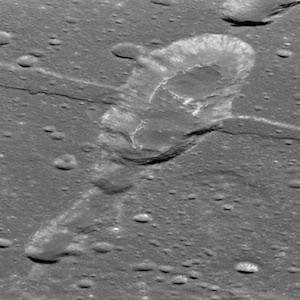 But NASA’s Lunar Reconnaissance Orbiter Camera helped scientists identify 70 more of these formations on the side of the moon closest to Earth. Their scattered distribution suggests that volcanic activity was widespread, and because of their characteristics and the lack of major nearby impact craters, scientists believe at least three of the IMPs were formed within the past 100 million years. In fact, that first IMP might even be younger than 50 million years old, and another is estimated at 18 million years old. 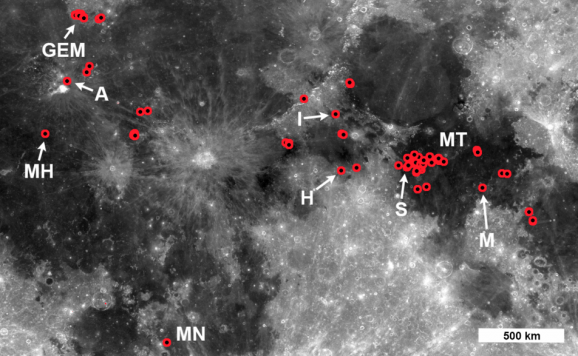 “The existence and age of the irregular mare patches tell us that the lunar mantle had to remain hot enough to provide magma for the small-volume eruptions that created these unusual young features,” said Sarah Braden, a recent Arizona State University graduate and the lead author of the study. The moon’s interior was warmer than originally predicted, and it may still remain warmer than we thought. In fact, it might still be warm enough to sustain more volcanic activity. Some could see that as a reason not to return to the moon, but the fact that our cold dead rock is neither cold nor dead seems to a pretty compelling reason for an eventual return trip.